Egg Ball No.2 (エッグボールNo.2 Eggubooru No.2) (named the "Egg Wheeler" by fans) is the second boss of Sonic Advance 3, and is fought in Sunset Hill's boss Act. As the name implies, it's a giant sphere mech with Gemerl stationed right in front of Eggman's cockpit. 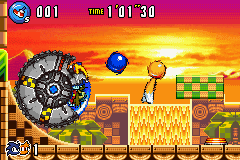 Eggman rolls around on the floors, walls and ceiling in an enclosed arena similar to the Catcher Eggman boss in an attempt to flatten the player. While the pattern is seemingly erratic, a temporary platform can be activated by a button in the center of the arena, allowing the player to dodge Eggman or reach his cockpit no matter where he is (interestingly enough, Eggman can also activate this platform if he rolls over the corresponding button). As the boss accumulates damage, it will roll faster and faster, making it more difficult to avoid and precisely attack. After eight hits (six on Easy), the boss will be toast, advancing the player to Sonic Advance 3's third stage, Ocean Base. This page was last edited on 15 December 2017, at 11:16.